WPI lab managers track the spread of flames during wind tests. A crew of graduate students had the unique opportunity to work in one of the country’s few academic burn labs with former firefighter and WPI professor Albert Simeoni, conducting innovative research aimed at giving firefighters and land managers an edge in battling wildfires. Working out of WPI’s Fire Protection Engineering (FPE) Performance Lab at Gateway Park, Simeoni, FPE professor Ali Rangwala, Seong-Kyun Im, aerospace engineering professor at the University of Notre Dame, and Notre Dame PhD student Giovanni Di Cristina designed and constructed a wind tunnel capable of replicating wildfire conditions. “I remember seeing over 50 fires burning in the mountains and thinking, ‘We have to do something about this problem,’” says Simeoni, who was once trapped in a dangerous wildfire himself. He was a firefighter for 10 years and assistant fire chief on the French island of Corsica in an area of repeated wildfires. It was this experience that sparked his interest to better understand and study how wildfires spread, in hopes of helping firefighters improve techniques to control them, thus sparing lives, the environment, and damage to property. 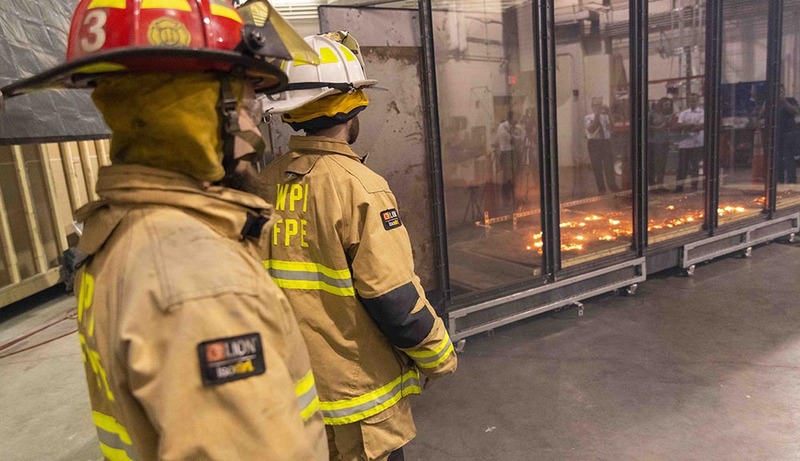 On Sept. 27, the wind tunnel was put to the test , as researchers ignited a controlled wildfire in the tunnel on a 20-foot bed of dry pine needles—a common fuel for wildfires—and other debris he had gathered over the summer from the floor of a nearby forest. Lab director and volunteer Brookfield firefighter Ray Ranellone was in charge of safety during the burn. 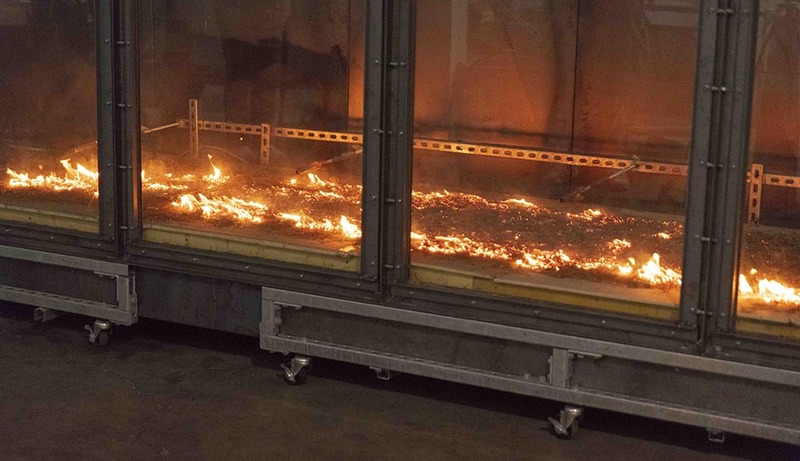 The large fans in the back of the wind tunnel were turned on, simulating 2 mph natural wind conditions, and in a couple of minutes the flames had quickly spread across the material, illustrating how rapidly devastating wildfires can move, spreading to brush and trees. Footlong metal rods placed vertically inside the tunnel helped measure the height of the flames. A large, dark, metal hood above the tunnel captured much of the smoke. Data from the burn was sent to computers for processing by students. “Fires start in the needles. It is the fuel,” Simeoni explains. “Even lightning has to reach the ground. This is the first stage of a wildfire.” Dry forest conditions hasten the fire’s spread, he points out. “If we can remove some of the fuel, the fire is less likely to climb the trees,” Simeoni says. Moreover, if managers are able to control the severity of wildfires by limiting the damage to the top layer of the forest floor, life in the soil (including recycling nutrients) could be spared. The experiments will help Simeoni understand why wildfires happen, he says, to help design mitigation measures. Simeoni says the knowledge gained through the simulation can be applied anywhere in the country—Massachusetts, California, or on some military bases—to give those who fight and manage wildfires the tools to understand how wildfires “climb the fire ladder” from the ground to the tops of trees. Simeoni plans to provide his findings to the U.S. Forest Service to give firefighters and managers better tools to fight the increasing number of devastating wildfires. The 40+ foot tunnel allows researchers to measure the spread and direction at different wind speeds. Pine needles are used as a fuel source in the wind tunnel. The wind tunnel is mobile and can be moved out of the lab for field testing. Two large fans, attached to the tunnel, can be programmed to change wind speed and direction.